You will be transferred to the Russian Aviation Museum (Monino) which is located in 19,9 miles / 32 km from Moscow, by the company's comfortable bus, together with a guide-interpreter. In hangars 59,140 ft2 / 5500 m2 and on the open area (20 hectares) 180 aircrafts, 145 air engines, 2548 samples of shooting, gun and rocket arms, subjects of the air equipment, clothes are located. In the end of Russian Aviation Museum Monino Tour you can buy magazines and catalogues about the Russian Aviation. * The price of Russian Aviation Museum: Monino Tour is given for group of 3 person. Please note that the price for Russian Aviation Museum: Monino Tour is a group price: the more tourists in the group, the lower the price for each tourist. Therefore, please contact us to specify the price for the group of tourists or for one tourist. The duration of Russian Aviation Museum: Monino Tour (from departure before returning) no more than 4.0 - 4.5 hours. You have to send passport information not later than 20 days before arrival to Russia. You pay for this Russian Aviation Museum Tour after his end. Payment in euro under the current exchange rate of dollar/euro is possible. Please look through the conditions and details of the reservation for Russian Aviation Museum: Monino Tour. The Central Museum of the Air Force - the largest and best Russian Aviation Museum (Monino). The basis of his collection is real aircrafts, helicopters, gliders and other flying devices, aviation engines, aviation arms. The Russian Aviation Museum today is the biggest aircraft in the beginning of 20 centuries "Ilya Muromets", Soviet "Concorde" (Tupolev-144), La-7 Ivan Kozhedub (62 brought down airplanes), Tupolev-95 (Bear on classification of NATO), Tupolev-22М (Backfire) and another. Participate in our Russian Aviation Museum: Monino Tour and you will see aircrafts which is not present anywhere more. Your guides will be the former deserved military pilots and navigators. 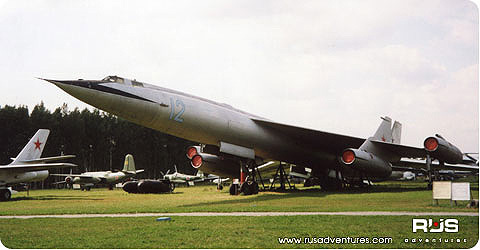 RusAdventures.com is the best offer on visit to the Russian Aviation Museum at Monino. Touch in exhibits of the Russian Aviation Museum: Monino Tour together with RusAdventures.com. Russian Aviation Museum: Monino Tour is not possible in any workday. On Wednesday and Sunday, as well as on official State Holidays of Russia this Aviation Museum is closed and Russian Aviation Museum Tour is not possible. 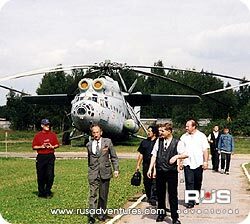 Compare our prices to other offers of Russian Aviation Museum: Monino Tour. Tourists from Germany attentively listen to the guide and admire with aircrafts of the Russian Aviation Museum: Monino Tour. © 2001-2012 Proton Management Ltd. All rights reserved.